Selecting quality and interactive vendors for your employee health fair is probably the most important aspect of the health fair planning process. You can't have a health fair without vendors, and you can't get your employees to attend their health fair if you have a bunch of vendors that do not spark their interest/curiosity. It sounds silly, but HR and benefits professionals can get too comfortable and invite the same vendors year after year. This reduces the excitement of your employees, and it also diminishes the benefit of hosting the health fair in the first place. 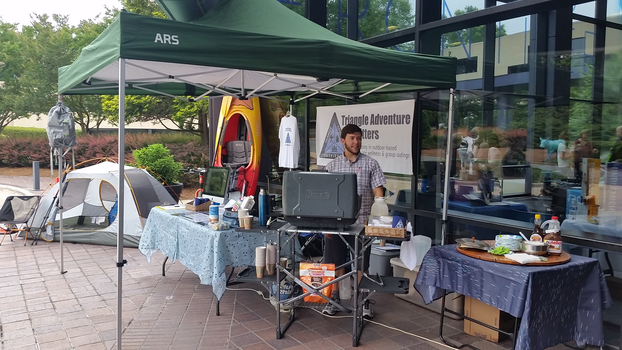 Help keep your employees active by offering different vendors that focus on outdoor activities. These types of vendors include bike shops, amusement parks, hiking, outdoor sports, etc.. If you have space (maybe even doing an outdoor health fair), these types of vendors will typically bring larger, more interactive health fair booths. Outdoor vendors are going to be the ones that give your employee health fair that carnival-like feel to your event. 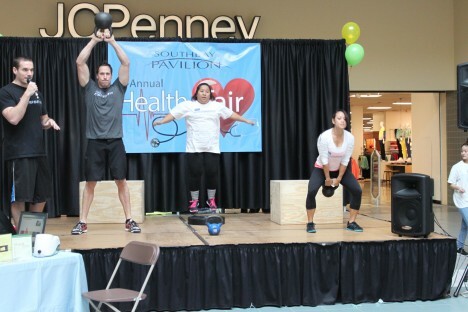 It's critical your employees have fun at their health fair. CrossFit has become one of the most popular ways for people to exercise, so this is typically a vendor you can find in your area. 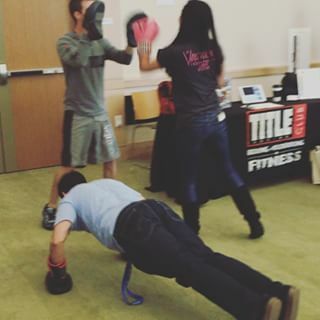 A CrossFit vendor usually comes prepared with an interactive exercise your employees can do right there at the vendor's booth. Securing a gym/fitness club to attend is always a plus, but finding a vendor that focuses on a particular kind of fitness training will spike your employees' interest and curiosity. If you want to learn more about CrossFit and other fitness programs, you can check out HomeGym's list of the top 10 CrossFit/workout blogs of 2016 by clicking here. If you haven't started getting fresh produce delivered to your office/worksite location - then you need to get on it! Local produce vendors will bring fruits and vegetables on a weekly basis to your place of work. Not only that, they typically bring samples to your health fair as well as give your employees the opportunity to schedule home deliveries. If you want your employees to adopt healthier eating habits, then provide them with the avenues and opportunities to do so. Yoga - Paddle Board, Bikram, Hot, etc. Having a yoga vendor seems like the norm, but don't just get the vendor that stands there and hands out material about the art of yoga. Choose a yoga vendor that is going to be interactive and can grab the attention of your employees - not to mention, get them involved. Also keep in mind there are numerous types of yoga vendors. Don't keep bringing out the same yoga vendor year after year. If you had a Bikram yoga vendor last year, bring out the paddle-board yoga vendor this year. And yes, paddle-board yoga is a real thing! Not only are yoga studios an excellent health fair vendor, but they can continue to come onsite for weekly/monthly classes. The reduction of stress on your employees should be paramount to you, and an onsite yoga vendor can be a huge push in the right direction. Boxing Gyms/Clubs is another fitness related topic on this list that is not going to be your typical gym/fitness club that you're used to securing for your health fair. More and more boxing gyms/clubs are popping up nationwide (it's not just LA Boxing anymore), so finding one to attend should not be too difficult. And keep in mind, you don't always have to be hitting/getting hit when you partake in boxing. Numerous boxing exercises are out there that aren't associated with trying to take someone's head off. Not to mention, boxing can be a huge calorie burner. Check out this article by Jay Schwartz to see the benefits of boxing over running/jogging by clicking here. 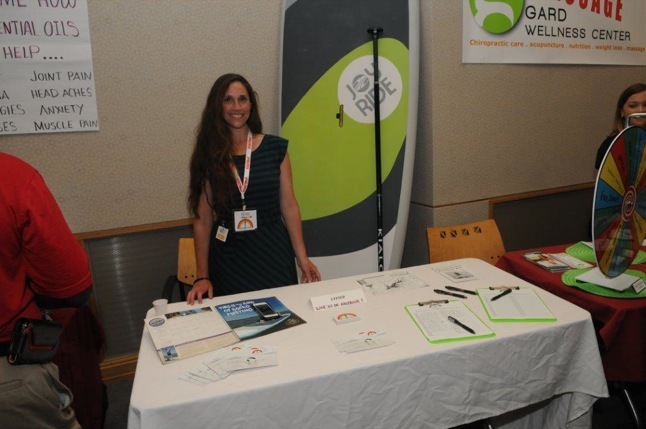 Are you struggling to find enough quality vendors to "fill" your health fair venue? Kill 3 or 4 birds with one stone and invite your hospital/health system. They'll be able to fix your problem. From experience, I have seen hospital/health systems bring multiple specialty clinics to employee health fairs, sometimes taking up 4 or 5 vendor booths. Not only does this fill up your health fair venue, but your employees will get to receive education on multiple health topics from different clinics. Another huge benefit is 99% of the time, they can offer some type of free screening like BMI or blood pressure checks. Bringing out multiple clinics might seem like a lot of coordination on your part, but typically, your one contact at your local hospital/health system can schedule all the attending clinics for you. Also keep your local hospital/health system in mind if you plan on having onsite biometric screenings (like cholesterol checks or glucose screenings) for your employees. They not only can provide these screenings but are typically cheaper with better customer service than your national biometric vendors. I'm not going to lie; this is likely going to be the most difficult vendor to find, and you'll probably need a little dinero in your budget. But if you do secure a healthy cooking demo for your health fair, I promise it will be a massive hit with your employees. Locking a healthy cooking demo down will be well worth your time and resources. And if you don't have the funds, try asking the local culinary school. Their students will sometimes provide a demo/tasting at no cost to you and your company. Want to make sure you spike your employees' interest in attending their health fair - bring out kittens, cats, puppies, and dogs. Now I would consider this more of a health fair "attraction" than a health fair vendor, but this is truly an excellent way to ensure you have an extremely high employee turnout. Not to mention, you increase the chances of saving a cat or dog's life. Do you really need another reason? Local shelters/adoption agencies are always looking to have an adoption event, so they will not hesitate to be a part of your health fair. *Want more info on health fair attractions? Check out this post: "Health Fair Attractions: Guns, Puppies, And More"
The following ideas are what I would consider "staples" for your employee health fair. They aren't going to reinvent the wheel, but I certainly recommend you include them in your 2018 event. 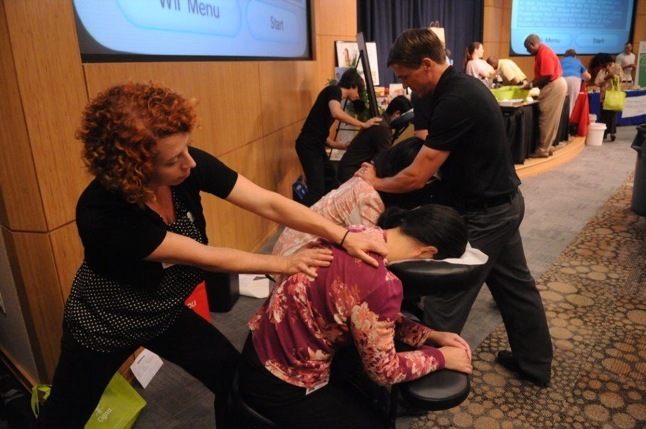 Believe it or not, it's easier than you think to secure free, 5-10 min massages for your employees at their health fair. If you're having difficulty, it's most likely because you're asking the wrong vendor. Rarely is a sole proprietor or a day spa/massage company going to provide free massages. However, the local wellness center is the place to look. They cover multiple services (chiro, massage, acupuncture, etc. ), so they don't mind offering free massages knowing they can discuss everything they have to offer. So, now you know where to look when it's time to secure free massages. It's pretty easy to secure one of the local dental practices to attend your health fair (that's the staple). But ever think to raise the standard in 2018 and make them provide something interactive? A free toothbrush is always nice, but isn't there more they could offer? There are dental practices out there that will go the extra mile and provide free teeth whitenings, more importantly, they will provide cavity checks. These cavity checks can be a huge benefit in regards to prevention. You shouldn't have a vision practice/center at your health fair that's not providing some type of vision screening. Whether it's your simple eye chart test that goes on the wall or an actual device they have at their booth, the local vision center can make it happen. 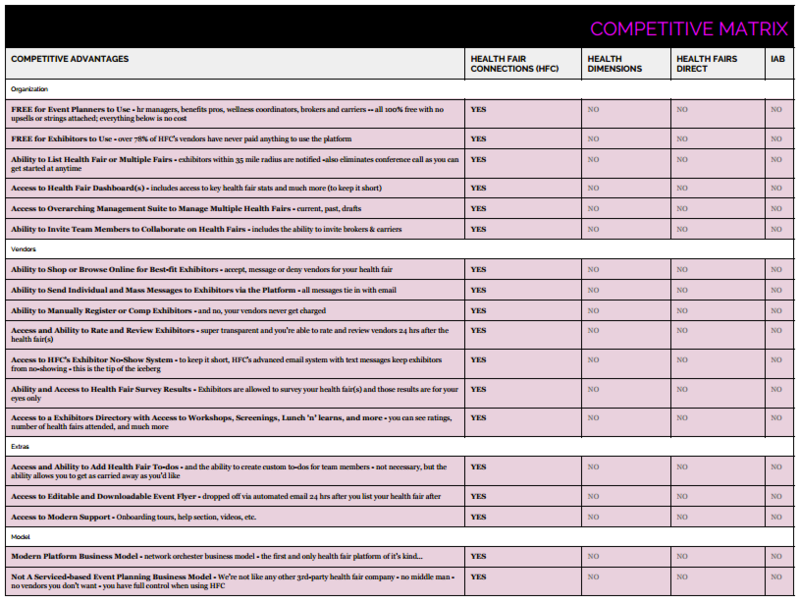 Now, of course, there are hundreds of vendor ideas you could go with for your health fair. Feel free to leave any comments and share additional ideas you have for 2018 employee health fairs.